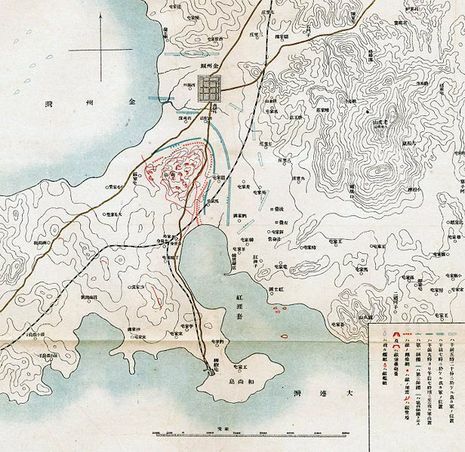 On 24 May 1904, during a heavy thunderstorm, the Japanese Fourth Division attacked the walled town of Chinchou (modern-day Jinzhou 金州), just north of Nanzan hill. Despite being defended by no more than 400 men with antiquated artillery, the Fourth Division failed on two attempts to breach its gates. Two battalions from the First Division attacked independently at 0530 hours on 25 May 1904, finally breaching the defenses and taking the town. 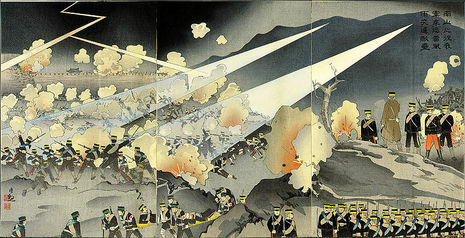 With his flank thus secure, General Oku could then commence the main assault on the entrenched Russian forces on Nanshan hill. The Japanese infantry assault was assisted by a prolonged artillery barrage from Japanese gunboats offshore. The Russians, with mines, machine guns and barbed wire obstacles, inflicted heavy losses on the Japanese during repeated assaults. By 1800 hours, after nine attempts, the Japanese had failed to overrun the firmly entrenched Russian positions. General Oku had committed all of their reserves, and both sides had used up most of their artillery ammunition. Finding his calls for reinforcement unanswered, Colonel Tretyakov was amazed to find that the uncommitted reserve regiments were in full retreat and that his remaining ammunition reserves had been blown up under orders of General Foch. Foch, paranoid of a possible Japanese landing between his position and the safety of Port Arthur, was panicked by a flanking attack by the decimated Japanese Fourth Division along the west coast. In his rush to flee the battle, Foch had neglected to tell Tretyakov of the order to retreat, and Tretyakov thus found himself in the precarious position of being encircled, with no ammunition and no reserve force available for a counter-attack. By 1920 hours, the Japanese flag flew from the summit of Nanshan hill. Tretyakov, who had fought well and who had lost only 400 men during the battle, lost 650 more men in his unsupported retreat back to the main defensive lines around Port Arthur. One hundred and three transports crowded with troops had been lying at Chinampo awaiting the news of the result of the battle of the Yalu. 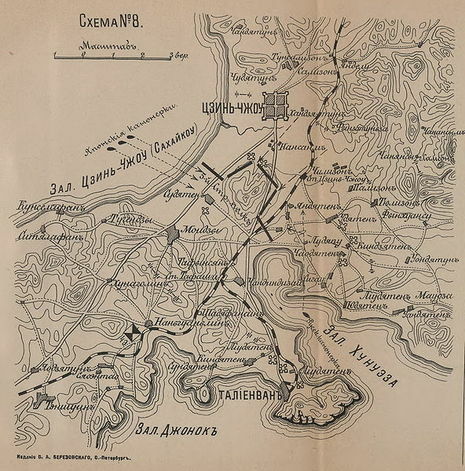 These transports carried the 1st, 3rd, and 4th Divisions, and an artillery brigade, which were destined to land on the south coast of Manchuria, between Takushan and Talienwan, to cut the communication between Port Arthur and the main Russian army, and advance along the railway against Liaoyang. For reasons connected with the suitability of the coast line, the point selected for the disembarkation was Houtushih, near the mouth of the Tasha river. Elaborate precautions were taken by the fleet to block the approach of Russian torpedo boats. The straits between Eliott Islands and the mainland were mined and patrolled. On 6th May the disembarkation commenced, and was not interfered with by the Russians, who hurriedly fell back northwards after making a reconnaissance; on the 7th and 8th the 3rd and 1st Divisions occupied a line along the Pitzuwo-Chinchou road from the Tasha to the Shouyi rivers. On the 10th the 4th Division began to land and assamble at Machiatun. On the 6th a force of the divisional cavalry supported by one and a half battalions had moved at once on Pulantien and cut the railway. It appears, however, that the demage was made good, and the communications were only definitely cut about the 13th.